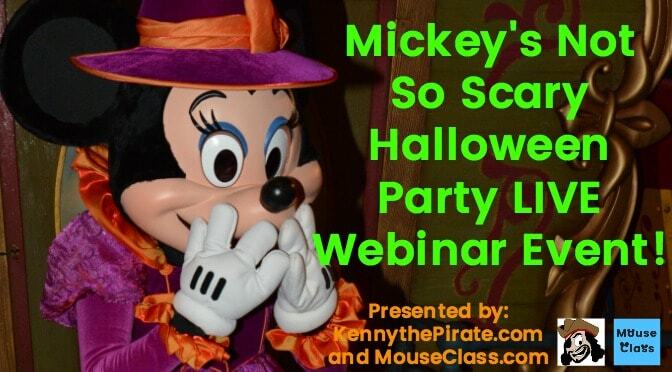 Mickey’s Not So Scary Halloween Party planning webinar coming soon! Announcing our very first Mickey’s Not So Scary Halloween Party LIVE webinar event! We are so excited to share the information we have compiled for you for this years Halloween party 2016! Have you attended the Halloween party in the past? Is this the first year you’re planning to attend the Halloween party? Are you still trying to decide whether you should attend the Halloween party this year? Would you like to learn some special tips? Would you like some treats without the tricks? If you answered YES then this webinar is for YOU! On Sunday, August 28, 2016, at 2:00pm EST KennythePirate and Mouse Class are going to join you LIVE! Bring your pen, paper, and Mickey’s Not So Scary Halloween party questions! Learn about the fails and successes of making your next party memorable. We will have lots of bonuses and exclusive offers too – because what’s a Halloween party without a gift bag?! What do you hope to see materialize for this special event? Just wanted to give a kudos (if people even say that anymore) to Kenny on the webinar. It was great – lots of helpful tips and responses to real questions. Very nicely done! Man! I really wanted to tune in but had some things go on and totally lost track of time!! So upset I missed it. Let me know if you are going to do again please! Hope it went well! Looking forward to the information! Just picked our Fast Pass+ this morning for the last week of October. So excited. I can’t wait. We aren’t going until next year but I want to learn everything that I can before we go! How many characters are present at the party that typically are not at the park? I read jack and Sally will be there but I didn’t know if there were any others that we might see. My family is going to dress up as mike, sully, boo(as a monster) and George Sanderson with a sock on him! I can’t wait!!!! Ahhhhh! :( I gotta work. Hopefully we can go back and read it. Just in time for our trip the last week of Sept. We went to the party last year and had SO much fun we just had to go back this year! Love following you Kenny and keeping up with new info :) Thanks! Thanks so much for doing this, Kenny! Looking forward to it! We will be at our very first party on Sept 20th. Hi from Brazil. I will be there. Mônica. Are you going to host a live webinar for the 2016 Mickey’s Very Merry Christmas Party? Great! I will keep a look out for times. Thank you! Is this only for World and not Land? Thanks KTP! We can do one for Land after it’s first party too! Would love to watch a video, we will be on the magical express at that time heading to check in for the week. Are you going to do something like this for mickeys Christmas party? Shoot, don’t get off work til 6. Are you going to post it after the event? Yes, please post it. My family leaves tomorrow morning for our first trip. ( just in time for the Hurricane ). We have tix for the Halloween party on friday night. Im thinking that we will have a washout day due to the weather and I can watch the webinar then. will you have the video on youtube after for those of us that can’t tune in at 2pm?